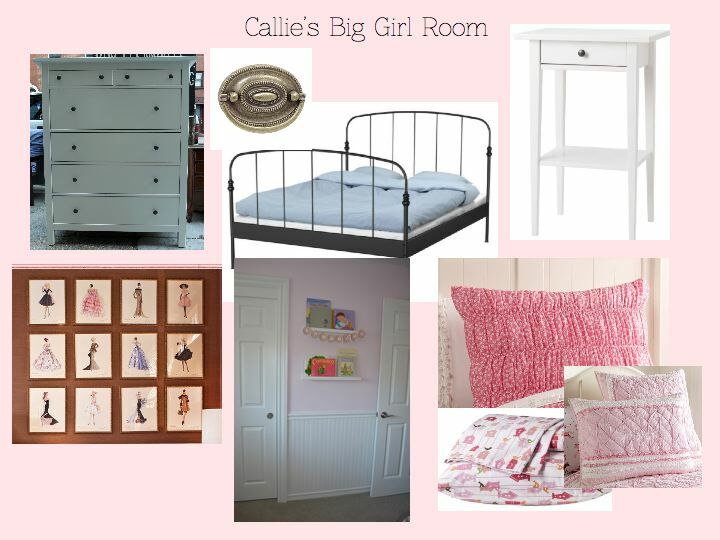 We finished Callie’s big girl room a few months ago but with the insanity of the holidays I am only now ready to post the big reveal. 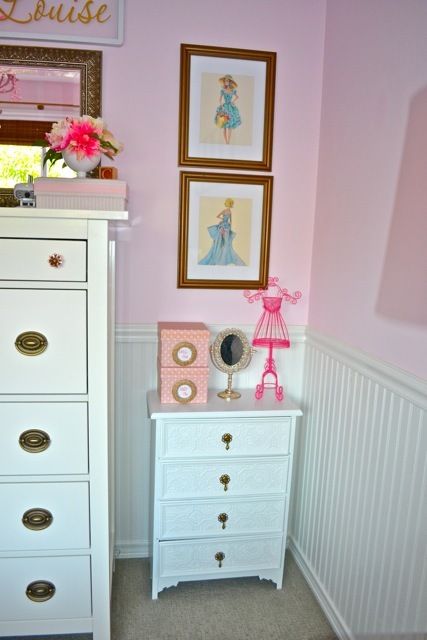 I already showed you the bead board wainscoting and the pink wall color in this post. Since my original post, we have removed her crib (sad face), purchased a full size bed from Ikea along with a dresser and nightstand. Let’s review my inspiration board and I can tell you where I diverted a bit. The bed isn’t exactly what I wanted. My inspiration board included this bed from Ikea. 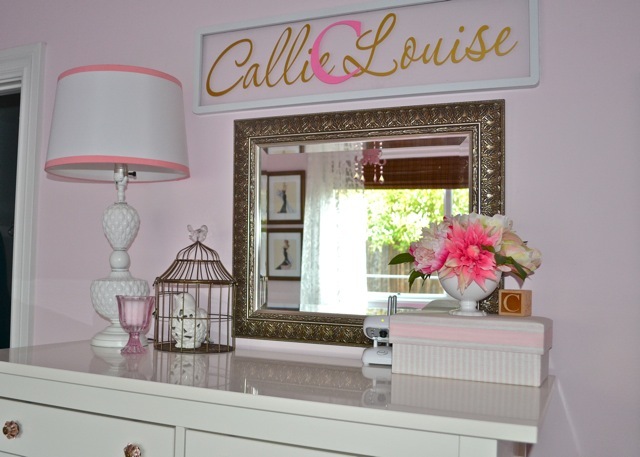 My plan was to spray paint it white for a softer, more girly feel. However, my local Ikea didn’t carry that bed in stock. The one we purchased was less expensive than my first option and already white. My preference is usually for something more simple but since the headboard detail is mostly covered by pillows anyway I gave it a shot. I love, love, love how the dresser turned out. It’s the Hemnes dresser from Ikea but with vintage inspired hardware it looks like the high end piece (see pic below) from Restoration Hardware Baby and Child. 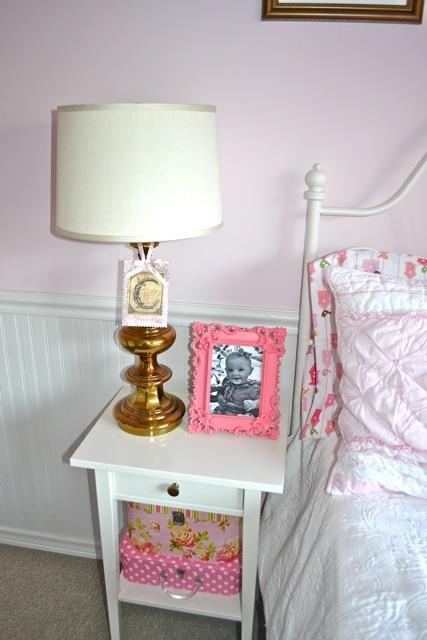 I decided to use some hardware I already had for the top drawers for a little touch of pink. The remaining pulls were purchased online at Van Dykes Hardware and were very reasonably priced at $4.50 each. 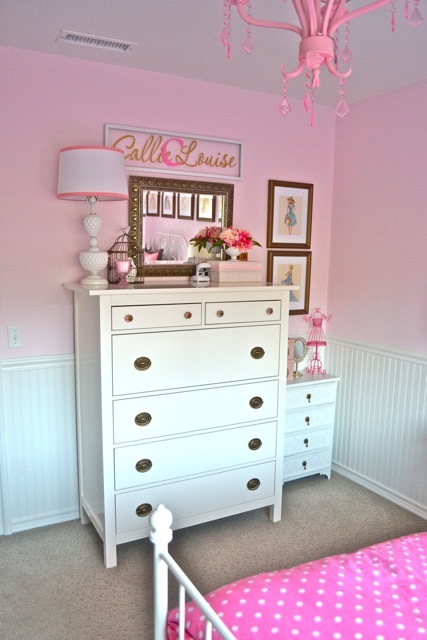 I spread out some the vintage barbie prints on the walls throughout her room as they would have been too close to the ceiling above the height of the new headboard. The bedding sources are as follows. 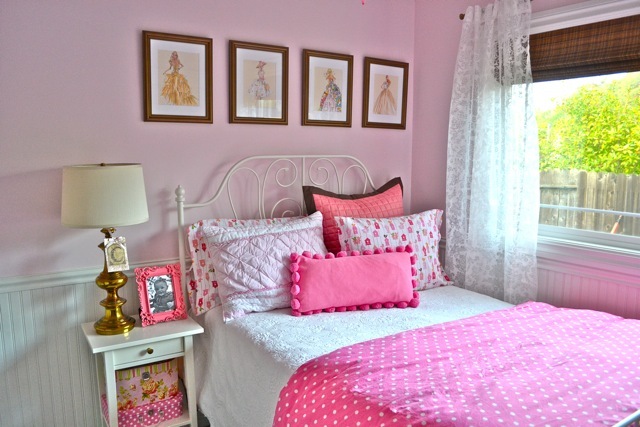 1) Pink polka dot duvet is Pottery Barn Teen which I won on eBay for $50. 2) The sheets were purchased for Callie by her Grandmother for Christmas last year – Circo Blossom from Target (no longer available). 3) The euro sham is Restoration Hardware Baby and Child purchased at their outlet store (no longer available). 4) The quilted sham is Pottery Barn Kids Brigette Ruffle Collection. 5) The boudoir pillow is Pottery Barn Teen Pom Pom Organic pillow. 6) The floral white blanket was purchased by yours truely many years ago for our guest bedroom and I think I bought it at Marshalls. I hope to make a few tweaks to the bedding. No surprise there, my friends can attest that I have a serious bedding addiction. I want to purchase another Brigette ruffle sham from PB Kids. I am going to ditch the RH Baby and Child euro sham for two matching euro shams (see pic below). I like the sham but I cannot find a mate for it and I am a bit OCD about beds having symmetry. In addition to the bedding changes, I really want to add crown molding to Callie’s ceiling. We will reuse the baseboard we removed when we installed the bead board since it was brand new. We will place it upside down on the ceiling and put the crown on top. This creates a custom, layered look on the crown and beefs it up quite a bit. I purposely did not do the greatest job of painting the ceiling edge knowing that someday it would be covered by crown molding. Stay tuned for a post on that project later this year. We also made some significant changes in Mason’s room which I will post later this week.